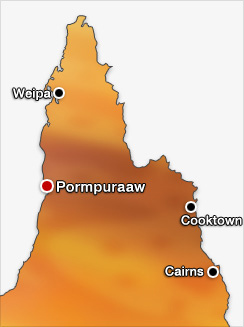 Pormpuraaw is on the west coast of Cape York Peninsula, about 500 kilometres from the tip of Australia.Two groups of Aboriginal people live in Pormpuraaw; the Thaayorre people who are traditionally from the areas to the east and south towards Pormpuraaw, including the Coleman River; and the Munghan who are traditionally from the north including areas along the Edward River and Holroyd Rivers. On 30 March 1985, the Edward River community elected five councillors to constitute an autonomous Edward River Aboriginal Council established under the Community Services (Aborigines) Act 1984. The Act conferred local government type powers and responsibilities upon Aboriginal councils for the first time. In 1987 the council area previously an Aboriginal reserve held by the Queensland Government, was transferred to the trusteeship of the council under a Deed of Grant in Trust. Also in 1987, the community changed its name from Edward River Mission to Pormpuraaw which was taken from a local dreamtime story, in the KuukThaayorre language of Traditional Owners, about a burnt hut or Pormpur.